This study was designed to investigate the effects of stenting across the branching arteries on the patency and stent-tissue responses over the branching arterial orifices. 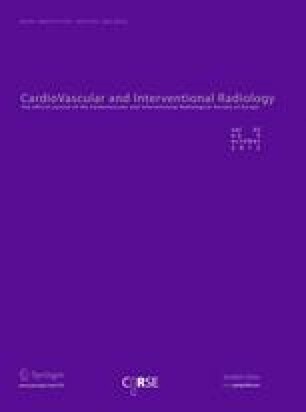 Thirteen dogs were observed after placing aortic stents across the celiac arteries (CA), superior mesenteric arteries (SMA), and renal arteries (RA). The animals were grouped according to stent types: large-cell group (n = 6) and small-cell group (n = 7). Angiography was performed to evaluate the branching artery patency at 2, 6, and 12 months after stent insertion, and the stent-tissue responses covering the orifices were evaluated on histopathologic examination. All branching arteries were patent on follow-up angiography; however, three patterns of stent-tissue responses over the orifices were observed: neointimal layering, bridging septa, and papillary hyperplasia. Although neointimal layering and bridging septa were evenly observed, severe papillary hyperplasia was more frequent at SMA and CA than RA. Four RA showed less than 50% ostial patency, and localized infarct was observed in six kidneys (24%). The ostial patency tended to decrease with small-cell stent during the follow-up period. Various stent-tissue responses over the branching artery orifices are induced by the aortic stent covering the branching arteries and may not be easily detected by conventional angiography. Subclinical renal infarct also may occur despite patent renal angiography.